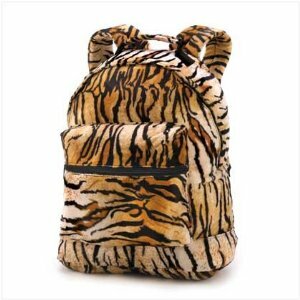 This totally “tiger-riffic” bag is the coolest look for school, shopping, or quick road trips! This roomy backpack features velvety plush fabric in a wild Tiger print; comfort-padded straps, giant center compartment with double-zip top and secret inside pocket, and a handy zippered pouch right on the front. 100% polyester fabric. Machine wash cold; tumble dry low heat. 14″ x 5″ x 18″ high.